A Path To Lunch: Cinque Terre - 16 Tips to Avoid the Crowds in 2019. Cinque Terre - 16 Tips to Avoid the Crowds in 2019. We've gathered the best 16 ideas from our own experience, from guidebooks and traveler forums, from both English and Italian websites, to insure you enjoy this enchanting part of Italy. Below are suggestions for Crowd Timing, How to Travel, Hiking, Activities, Where to Stay, When to Go, When Not to Go, and More Info. We hope they help you. Happy Trails. 1. Get Up Early / Stay Out Late. Adjusting your day's schedule will greatly help you avoid crowds, keep you cooler, and the angled light will enhance your photos. 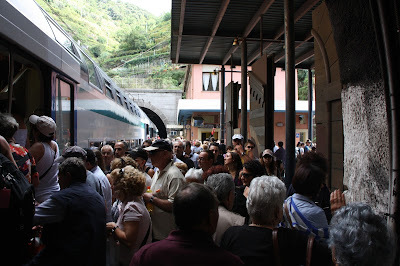 The surge of short-term visitors on the trains and in the village centers is greatest from about 10 am to 4 pm. Schedule and route your activities to accommodate. Visit one of the lesser crowded CT towns in the middle of the day - Corniglia or Riomaggiore, or nearby Portovenere, Levanto, or La Spezia. Start your hike in the fresh morning, and stop for a picnic or up-slope restaurant lunch for midday. Enjoy the beach or rent a kayak when the sun is high. 2. Take the Boat. The ferry boats are a great way to see the Ligurian coast and reach the villages. While they are very popular, they are not as crowded as the trains (especially true of the 1st boat of the day). A full day ticket (with stopovers allowed) is about 33 Euro and they operate to the CT from La Spezia, Lerici, Portovenere, and Levanto. There are also excursions from the Portofino and Viareggio areas. See our Ferry / Getting Around Page for links to all our articles with complete schedules and prices. Ferries can sometimes be canceled due to wind & waves, but that's unusual in the high season. 3. Avoid Holidays. Holidays and weekends, especially in good weather, produce more visitors. If the holiday flanks a weekend, it can have an additive effect. The days to consider avoiding are Easter Sunday and Easter Monday (in 2019 that's April 21 & 22), April 25 (Liberation Day), May 1 (Labor Day), June 2 (Republic Day), August 15 (Ferragosto). 4. Take a Bus or a Minibus If you are hiking, you can reach good trails by taking a bus from La Spezia to Campiglia, Colle di Telegrafo, Biassa, Monesteroli or Riomaggiore Bivio to start a hike on several trails including the AVG-1 (Sentiero Rosso) toward Portovenere or into the Cinque Terre Park and down to the villages. 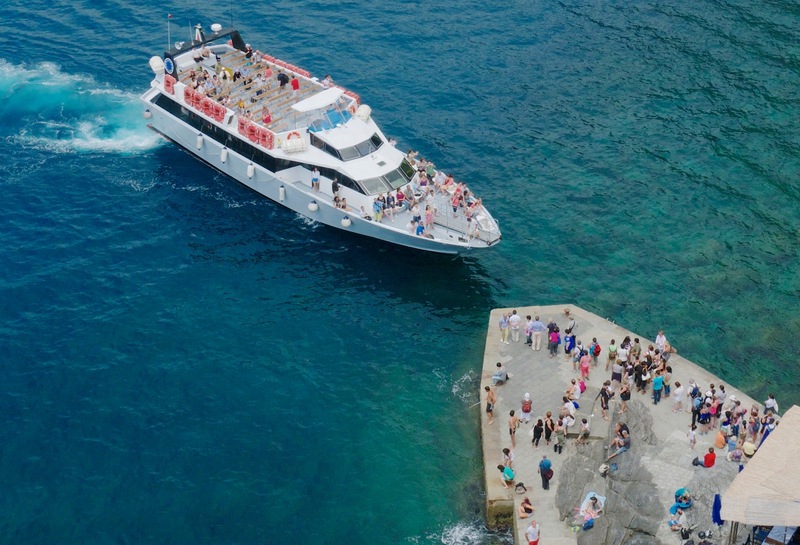 Transfers between the Riomaggiore minibus, the Manarola minibus and Bus 29 from La Spezia are also possible - see the Route Finder. On the ATC bus company ATC Website (EN) you'll find system wide schedules, an interactive map, and a Route Finder. The regular buses appear as a solid blue line, the CT minibuses as a dotted blue. CT Park Minibus Schedules (Feriale is Mon-Sat. (Mon-Fri if grayed). Festivi is Sun. & Holidays.) The La Spezia - Campiglia is bus 20 , the La Spezia - Biassa or Colle Telegrafo is bus 19, La Spezia to Bivio Riomaggiore is bus 19 or 29. 5. Take a Taxi Sure the train is quick and cheap, but you're on vacation and the fares are thinkable, especially for a group. The published taxi fare from La Spezia to Riomaggiore is 35E, to Manarola 40E, to Vernazza & Corniglia 70E, to Monterosso 80E. There may be a small charge for baggage and extra people, but drivers don't expect a tip. Link: La Spezia Radio Taxi (prices are under Tariffe). Portovenere Peninsula, Palmaria & Tino Islands. St. Peter's Church is visible. We took this on the Sentiero Rosso (AVG-1) 25 minutes south of Campiglia. Some routes to consider: Levanto to Monterosso (3 hours), Campiglia (or Telegraph) to Portovenere on the AVG-1 (2 to 3.5 hours), Corniglia to Manarola via Volastra (Trail 7a to 6d to 6) (2 hours). You can see more on this map which is widely on sale in the CT.
Where to Stay to See Cinque Terre? Which Village? Book as early as you can - the CT is very popular. We advise reserving four months ahead. We use and recommend Booking.com because they have an excellent selection of hotels with VERIFIED REVIEWS! Liguria Hotel Guide & City Selector. Choose a pretty Ligurian town nearby as an affordable base to see Cinque Terre and other famous towns. We describe all the Pluses & Minuses. Corniglia & trail, photo from Volastra on trail 6d in May. 7. Park Above and Hike to a Village You should not drive down to the Cinque Terre villages themselves both because the roads are terrifying, and because there's no parking (the exception for the informed & judicious is Monterosso). However, the Cinque Terre Park is large and you can easily find places to park along the roads higher on the hills. You can use one of the many trails to hike down to a village. If you plan well, you can use a CT Park minibus to take you one or both ways. See Take A Bus above. 8. Rent a Mountain Bike You can rent a mountain bike from the Cinque Terre National Park at Montenero Sanctuary on the hill above Riomaggiore. The MTB network of trails roughly follows the AVG-1 (Sentiero Rosso) and the views will reward your effort. The terrain varies in difficulty from easy to challenging, but no one is watching if you walk the bike part way. A day rental is about four euros with the Cinque Terre card. 9. Go Kayaking or Boating If the water's calm and warm, rent a kayak and/or snorkel gear at the only authorized dive center, the 5 Terre Diving in Riomaggiore. Also known as Coop Sub 5 Terre, the experienced operators organize dives, group kayak trips for those who wish, and also rent kayaks. There are other kayak and boat rentals along the coast, such as Nordest in Vernazza or Cinque Terre dal Mare (By Sea) in Riomaggiore, so ask locally as well. It's just a 30-45 minute paddle between each village within the CT - and it's really beautiful. It's not a Marine Protected Area for nothing. 10. Do Stay in a Cinque Terre village. Since the day trip visitors are concentrated in mid-day, staying in a village gives a special feeling to the night and mornings, and the ability to adjust the timing of your activities. Also, not all the villages are equally crowded. Monterosso is the largest with the most hotels and a resort feel, and can handle the most visitors with the least stress. Corniglia is visited the least because it is not at sea level. 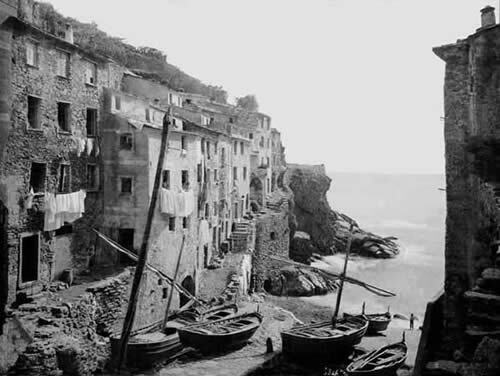 Riomaggiore gets a good share of visitors but pretty Manarola gets more. 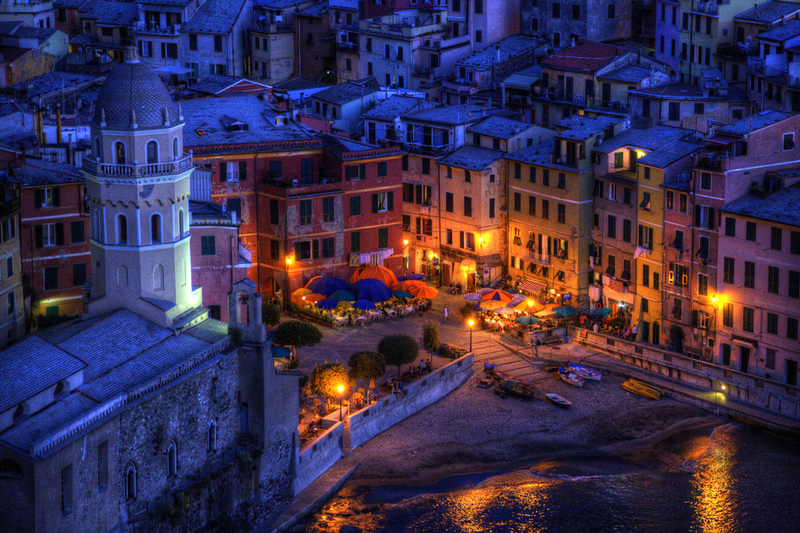 The extravagant charm of Vernazza makes it the most visited. Links: Booking.com Cinque Terre HomeAway(Cinque Terre). 11. Don't Stay in a Cinque Terre village. 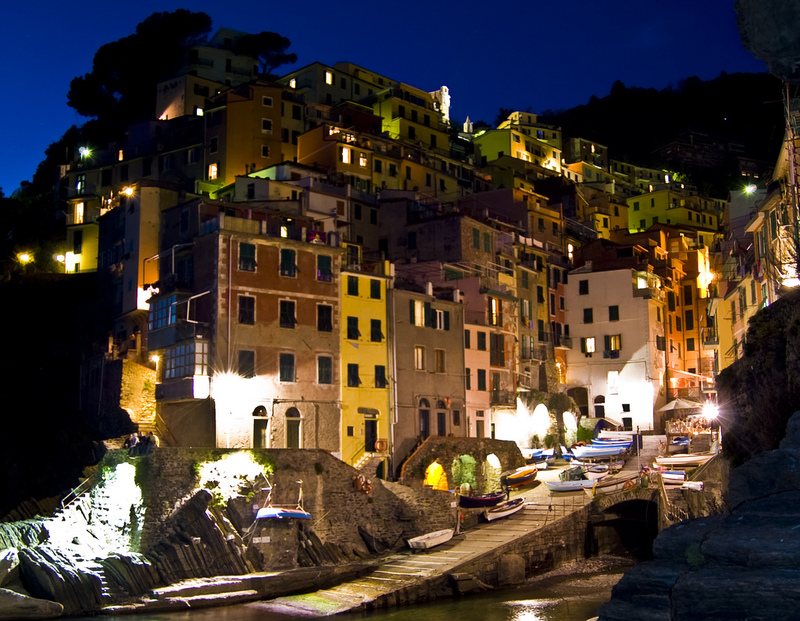 Use a nearby town as a base and take the train or boat or hike into the Cinque Terre. You'll be able to enjoy the attractions of another pretty Ligurian town, experience a less crowded town, and there's a very good chance you'll spend less. We have series of three articles to help you decide which town is best for you. Your click will support our efforts to help travelers like you. Part 1 Liguria Hotel Guide & City Selector Gulf of La Spezia - Lerici Portovenere La Spezia. South of Cinque Terre. Part 2 Liguria Hotel Guide & City Selector Levanto, Bonassola, Moneglia, Sestri Levante, Lavagna, Chiavari. North of Cinque Terre. Rapallo, Santa Margherita, Portofino, Camogli, Recco. Visit both the CT & Portofino. 12. Stay in the Cinque Terre Park. Stay in accommodations within the Cinque Terre Park but not in one of the five villages. Especially if you're hiking, using the CT minibuses, or driving, these up-slope alternatives might be just what you need. You can still get to the five villages and trails but these facilities tend to be quieter, greener, have parking, and be a better value. 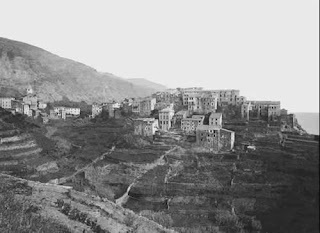 Some are rural, some in little communities like Volastra or Groppo (both on bus line to/from Manarola), or San Bernardino (bus to/from Corniglia). To locate accommodations a bit inland, use these links Booking.com Cinque Terre or HomeAway(Cinque Terre) and click on the map words 'Show Map' and then keep magnifying (+) the map 6 or 7 times. Most hotels, B&Bs, and other listing will describe access between their facility and the villages. Where the Heck are These Places? Our Liguria / Cinque Terre Map showing the all the cities & towns in and around the Cinque Terre. From 2016, the 'Cinque Terre Express' has meant somewhat less crowding. 13. Check the Cruise Line Schedules Large cruise ships dock in La Spezia with more than 600,000 passengers a year. More than a few of these nice folks become day visitors to the villages. Because they have limited time, the 'cruisers' impact is mostly in mid-day on the trains, the towns' main thoroughfares, and the easier trails. They have little impact on the hilly trails and the ferry boats. It is possible to check the cruise ship docking schedules against your proposed dates, but they are often not comprehensive or up to date. Also, there are many other sources of group tours, including bus tours from cruise ships in Livorno, which use the trains from La Spezia for the final leg. Links: Crociere La Spezia and La Spezia Cruises (Cruisett). 14. Visit during the off-season. 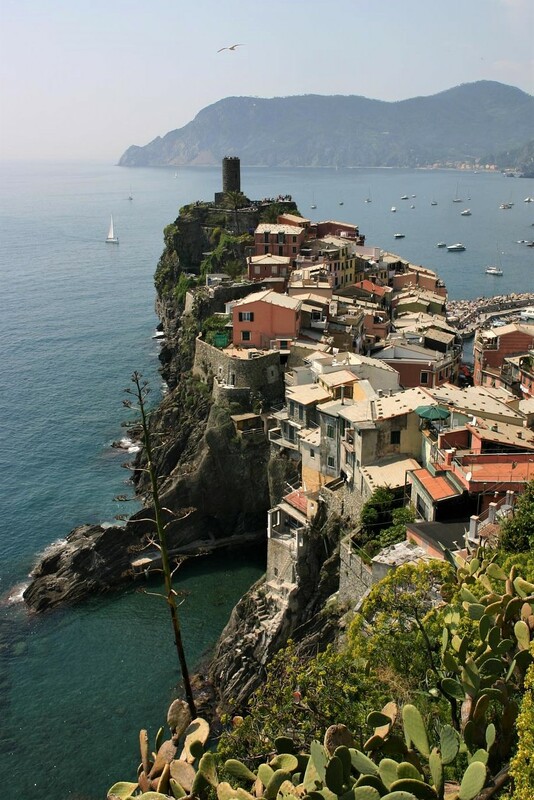 The Cinque Terre can be enjoyable for hiking and exploring in good weather all year. However, for ordinary travelers, we only recommend April & October as 'off-season' visits. See When To Go below for our advice by month. If you do go in deep off-season, there are downsides to evaluate. --Fall and winter rain storms can be quite windy, and last several days. --The trails can stay wet and slippery for extended periods and the views are obscured. --The ferries will not be running from the 1st weekend of November to late March. --Many businesses, hotels, and restaurants close off-season. The villages will feel and be empty. --The buildings are old; accommodations that are open may be chilly when the weather's cold. --The latitude is 44 degrees - like Minneapolis, MN or Hobart, TAS. so the nights are long. On Dec. 25, that's less than 9 hours of daylight. --Weather is not predictable until a week ahead, so reserve only a few days in advance. --Have alternate plans ready and have notes on hotels or B&Bs suitable for last minute plans. 15. Visit other Ligurian towns instead Along the Ligurian Levante coast (south of Genoa) there are other enchanting towns that have a lot in common with the Cinque Terre and are well worth a stay or a visit. You'll see Ligurian architecture, landscapes, and historical sites that are very characteristic, and enjoy the Mediterranean ambiance. We recommend: Portovenere, Lerici, and Tellaro on the Gulf of La Spezia; Moneglia and Sestri Levante on the Gulf of Tigullio north of the CT and south of Portofino; and Camogli on the Gulf of Paradise. Camogli is also famous for its fish festival, and it makes a good base for seeing the Portofino Peninsula which lies to its south. See the Hotel & City Guide Links above and this Link: Liguria / Cinque Terre Map. 16. When To Go When Not To Go What's the Best Month To Go? The Cinque Terre are about nature and hiking, seascapes and landscapes, the people and their historic villages & terraced vineyards. The weather varies from year to year, of course, but we hope our opinions, based on several decades in the area, will help you plan. January, February Hiking can be a pleasure in good weather, but, sorry to say, no other reason to go. March Enjoyable in good weather, but rainy periods fairly likely. Little greenery, sleepy towns, ferry only at month's end. April In the first half the plants are starting and the weather mostly pleasant, perhaps a bit chilly. In the second half trees blossom and flowers appear, temperatures are good, rain less likely. Crowds are usually modest. May Heaven on earth. Mediterranean landscapes exploding with green. Sea still cool, any rain usually short-lived, heat unlikely, crowds are now a factor. June Land and sea are wonderful, not usually hot. Swimming begins to be possible. Crowds are frequent. Vacation season truly begins mid-month and then crowding is unavoidable. July, August Warm to hot, sometimes very hot. Very crowded most days. A good stay requires being adaptable to the weather and crowding. Hiking best in early morning for most folks on most days. September Good weather, heat possible early in the month. Lively and enjoyable but usually crowded including lots of day trippers from cruise ships. Grape harvest usually in 1st half of month. October First half of month usually has good weather. Autumn colors develop during the month. Chance of long rain storms. Ferry running, but weather dependent. Less crowded, but no shortage of mid-day visitors from cruise ships in the town centers. November Hiking and exploring in good weather when autumn colors enhance the beauty. Rain and clouds likely. No ferry. Reduced train service. Not at all lively. December Hiking only in good weather. Little to do & little daylight.Villages are hibernating except for a few Christmas festivities & decorations. Links: Where to Rent a Car from Cinque Terre - La Spezia, Genoa, or Pisa? We are Martha and Mike from Boston- recently retired photo editors who enjoy travel, food, and helping people. We have visited Italy for three decades, and we live in Liguria part-time. We have no connection to the car rental or hotel industries, and we receive no payments or free stuff for our writing or opinions. As is internet convention, we receive the standard commission for clicks on many of the commercial links that result in a purchase. Your clicks will help support this site. *dolce far niente: Literally 'sweet doing nothing', i.e. delicious idleness.